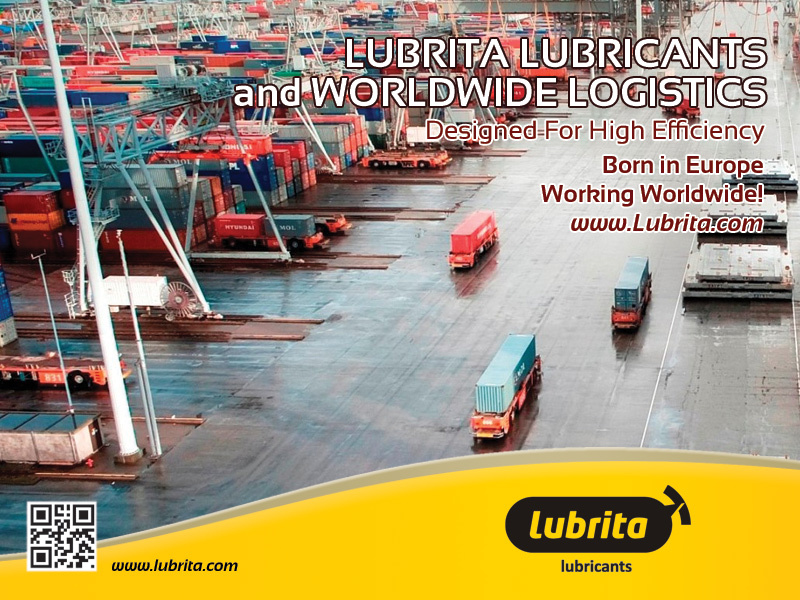 LUBRITA provide first class logistics support to oils and lubricants Distributors worldwide! To ship containers we use Rotterdam and Hamburg ports - Logistics gateways to Europe and beyond. The Netherlands plays a key role in the globalised economy, by connecting producers and consumers worldwide via sophisticated logistics. Success is based on a combination of cutting-edge infrastructure, world-class service providers, and a coastal location at the heart of Europe. Key factors are the Port of Rotterdam, Europe's largest port and fourth-largest worldwide, and Amsterdam Airport Schiphol, a major European air-freight and passenger hub. Both are supported by world-class logistics service providers and an extensive network of roads, railways, inland waterways and pipelines. This powerful combination has made the Netherlands the 'Gateway to Europe' accounting for significant quantities of European road- and water-transport. The Netherlands also makes extensive use of Information Technology to deliver optimised supply chain solutions in sectors where time is critical, such as food and flowers. In addition, the Netherlands is pioneering developments in environmentally sustainable logistics operations and silent logistics. The Netherlands occupies a strategic position: it is central within Europe, and at the mouth of rivers which reach deep into the economic and industrial heart of Europe. The Rhine has the greatest concentration of freight flows anywhere in the world. This has allowed the Netherlands to develop into the gateway of Europe. The Netherlands is the country of choice for European Distribution Centres is: 57 percent of all American and Asian EDCs on the European continent are located in the Netherlands. The country hosts over 19 million square metres of distribution centre capacity. This is equivalent to an area the size of some 3,000 soccer fields. All major Dutch ports are serviced by companies specialising in storage, transhipment, industrial processing and auxiliary services, as well as transport, packing, warehousing and distribution. The Netherlands is one of the leading road transport nations in Europe and the largest inland shipper. The Betuweroute, a dedicated double-track freight railway, enables rapid transport of containers and bulk goods from Rotterdam to the European hinterland. From the Port of Rotterdam, goods can be delivered to all major industrial and economic centres in western Europe in less than 24 hours. Under the 'Smart Cargo Hub for Europe' initiative, Amsterdam Airport Schiphol, the Port of Amsterdam and the private sector aim to turn Amsterdam into the fastest and most-reliable multimodal hub for Europe. The Netherlands is a leading country in electronic information sharing between port authorities and vessels. The liberalisation of the aviation sector has led to greater competition and has, in turn, made room for large intercontinental alliances between established airlines (e.g. Air France-KLM). Liberalisation has also opened the way for new, competitive products in air transport. Dutch inland shipping accounts for 54 per cent of all European (EU 27) trade shipping. Nearly half of the northwest European vessels (6,500 out of 13,500) sail under Dutch flag. In 2010, IMD Business School ranked the Netherlands 2nd worldwide with regard to the quality of its water transport infrastructure. The Netherlands accounts for approximately 14 percent of international road transport in the EU. The Netherlands has the second-greatest cooling and freezing storage capacity in Europe. Some 34,000 seagoing vessels and 133,000 inland vessels pass through the port of Rotterdam every year. The Netherlands won three awards at the 2010 Asian Freight & Supply Chain Awards for the categories: Best Seaport in Europe (Port of Rotterdam), Best Container Terminal in Europe (ECT), and Best Airport in Europe (Amsterdam Airport Schiphol). The Netherlands achieved fourth place in the 2010 World Bank Global Logistics Performance Index (based on the efficiency and effectiveness of its customs, quality of transport, IT infrastructure for logistics, and ease and affordability of shipping). The chemicals industry is one of the leading business sectors in the Netherlands, making a significant contribution to the economy. The Netherlands is one of Europe's leading suppliers of chemical products and services. Important raw materials are available or easy to supply while an extensive transportation network provides access to Europe and beyond. Some of the leading chemical companies in the Netherlands are AkzoNobel, Shell, DSM, Purac, MSD, and ECN. Research institutions include TNO, Delft University, Twente University, Wageningen University and Eindhoven University. - In 2010, the estimated turnover of the Dutch chemical industry was 47 billion euros, an increase from 38 billion euros in 2009. - The chemical sector accounts for approximately 3 percent of the Dutch gross domestic product. - About three quarters of the chemical products produced in the Netherlands are exported. Of that amount, three quarters goes to countries within the European Union and one quarter goes to non-EU countries. In 2009, exports to countries outside the EU increased a significant 4.5 percent. - The Dutch chemical industry is an innovative sector, with roughly two-thirds of companies delivering product and process innovations. - The industry spends around 2.5 percent of its turnover on research and development, approximately 1.3 billion euros. - In 2009, approximately 65,000 people worked in the chemical industry. - The chemical industry supplied products to a wide range of other industries. Approximately two thirds of the sales of the chemical industry concern basic chemicals. LUBRITA lubricants and chemicals LOGISTICS WORLDWIDE – we supply our customers worldwide from biggest European ports in Germany and Netherlands.